Now... I love a good tostada, so that was fine with me, but why'd they call it a chalupa on the menu? Some folks say it's because they are really the same thing - well, as far as American Tex-Mex food goes - and that a chalupa isn't concave at all, at least not in the Tex-Mex form we're accustomed to here in the U.S. It is, indeed, a flat toasted or fried corn tortilla finished with a variety of toppings. So... that's what it boils down to really - whether you're talking authentic Mexican chalupas, or Tex-Mex chalupas, neither of which applies here anyway, since I'm deconstructing it, into the form of a casserole. So... Chalupa Casserole it is, and I'll just have to endure the folks who surely will stop by to insist how silly and misinformed I am to attach the word chalupas to such a thing! So be it. Southern Style Hissy Fit Warning: As I have learned over my years of blogging, there are a lot of folks who just want to argue. Food does not escape that wrath and neither do personal recipe blogs. We are certainly bad about that in the south. Sugar in cornbread or grits, what constitutes a "butter bean," whether chicken and seafood belong together in a gumbo, wild American seafood versus imports, what really makes a "po'boy," cottage cheese in lasagna, dressing versus stuffing and whether bread belongs in it at all, rolled or dropped dumplings, whether marshmallows still have a place on top of sweet potato casserole, proofing yeast in baby bath temperature water, and any other number of food related topics, have, and continues to drum up arguments among many southerners. Everybody seems to have an opinion. As a lover of the flavor profile of all things Southwestern, Mexican or even more appropriately perhaps, our American version of Mexican food called Tex-Mex, deconstructed skillet meals and casseroles are also a favorite for me, simply because they are a good bit of less effort than individual plated servings. This is just another fun one! I'm using shredded pork here because I made pork and beans and wanted to utilize the leftovers. A variety of fillings fit here, cooked shredded chicken or beef, or cooked ground beef certainly. This is a good dish to use up some of those taco sauce packets you have hanging around. C'mon now, you know you have some... don't act like you don't! Here's how to make my Tex-Mex style, Chalupa Casserole and even if it is misnamed, it's delicious! Scroll past the step by step pics for the full recipe with ingredient list, measurements and instructions, as well as a printable document. PLEASE NOTE. I keep getting requests for access to print. There is no need to request access in order to print or to save that printable to your Google drive. Access is specifically for editing only! I don't think there's an easier casserole to make. Here's how. Preheat oven to 375 degrees F. Butter an 8 or 9 inch square dish; set aside. Mix the shredded meat with the beans and seasonings; taste and adjust as needed. Layer half the tortillas, seasoned meat, taco sauce and shredded cheese in prepared dish; repeat layers. Cover and bake for 30 minutes, uncover and bake 5 minutes longer. Let rest for 10 minutes, then garnish with lettuce, tomatoes and onion. Slice into squares and serve with additional taco sauce at the table. For more of my favorite Tex-Mex recipes, check out the collection on my Pinterest board! Preheat oven to 375 degrees F. Butter an 8 or 9 inch square dish; set aside. Mix the shredded meat with the beans and seasonings; taste and adjust as needed. 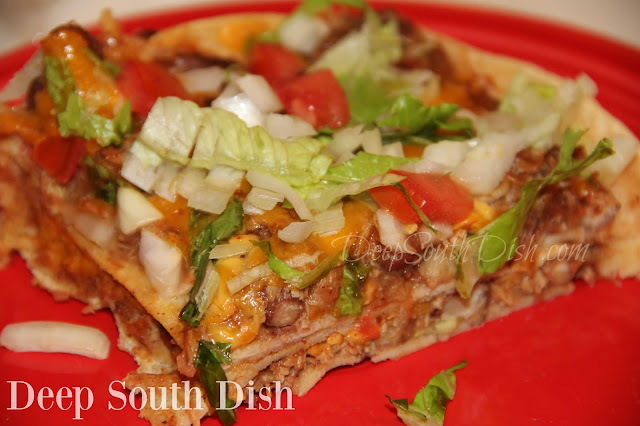 Layer half each of the tortillas, seasoned meat, taco sauce and shredded cheese in prepared dish; repeat layers. Cover and bake for 30 minutes, uncover and bake 5 minutes longer. Let rest for 10 minutes, then garnish with lettuce, tomatoes and onion. Slice into squares and serve with additional taco sauce at the table. Cook's Notes: Double for a 9 x 13 inch casserole. I used shredded pork from the Slow Cooker Pork and Beans recipe, which included beans. Use leftover beef pot roast, pork roast, a rotisserie chicken, freshly poached chicken or unsauced pulled pork, keeping in mind any seasonings already incorporated from whatever meat you are using. Give it a taste first, then begin adding in the additional Tex-Mex seasonings to taste. I add a few dashes of Cajun seasoning also. May also use cooked and drained ground beef. To soften tortillas, pour a little chicken broth into a pie plate and dip them as you place them into the casserole dish. What you are thinking of as chalupas could also be called sopes depending where in Mexico the folks in the restaurant. It's like the taquito vs flautas, or whether the cook puts hominy in the menudo. On this is certain though, yellow corn meal and sugar in cornbread is an utter abomination unto God. Drag out your soapbox any time Miss Mary. Enjoyed your very mild rant. So, in your kitchen, what is "chili powder"? Is it a premix (like Gebhart's) or a single type of chile that's been powdered? Like Ancho and New Mexico. Do you make your own mix? I do. Nope. I do not powder down chile peppers - just grocery store spice works for me! Love the Tex-Mex flavors in this. Your recipes always turn out so good, and I'm sure this one is no exception! Can't wait to try it. I think I'll use ground beef. Or maybe a mix of ground beef and chorizo?